Thai Green Papaya Salad Recipe (ส้มตำ) - Thai Street Food Style! Thai Green Papaya Salad Recipe (ส้มตำ) – Thai Street Food Style! 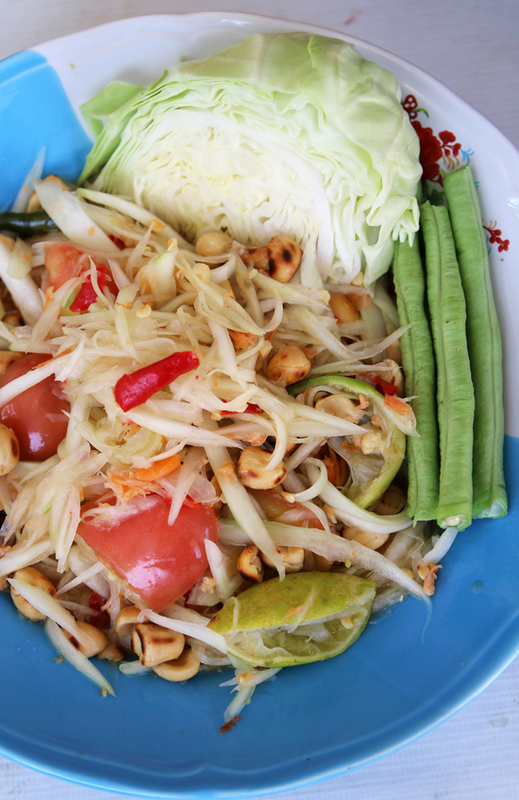 Thai green papaya salad, which in Thailand is known as as som tam (ส้มตำ), is one of the most commonly available and popularly consumed dishes in Thailand. Som tam (ส้มตำ) originates in the northeastern part of the Thailand (Isaan), which is on the border of Laos, where the same dish is a staple as well. 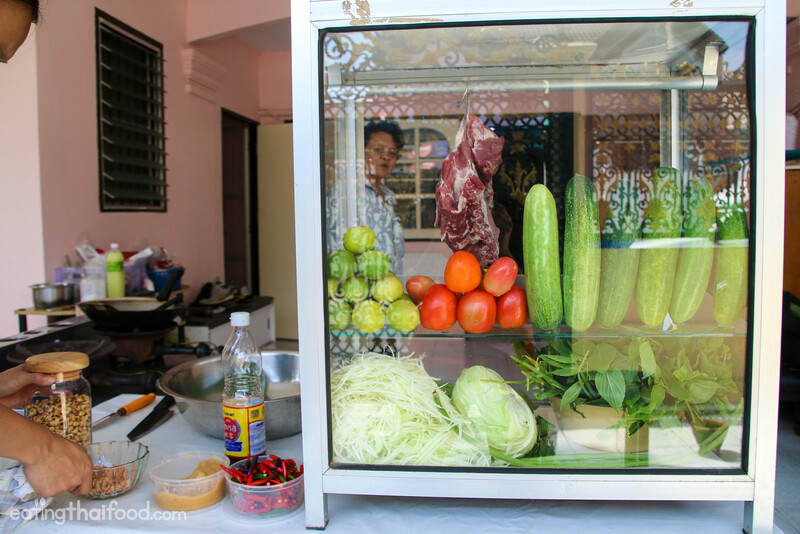 You’ll now find green papaya salad everywhere throughout Thailand, and on just about every street corner in Bangkok. In this Thai green papaya salad, you’ll learn how to make an authentic version of som tam, that’s easy to make, and tastes delicious. 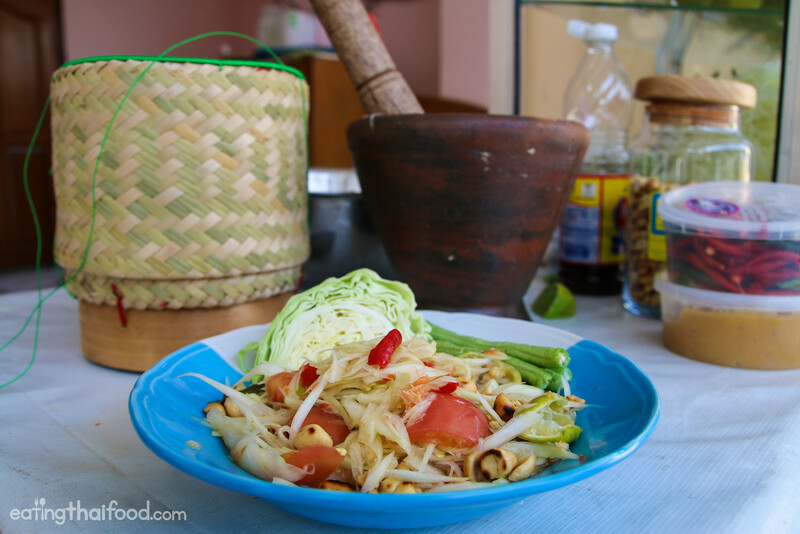 Before we get started with the Thai green papaya salad, I want to quickly give you an overview of the different types of variety of green papaya salad available. Som tam Thai – This is one of the mildest versions, where the dressing is sweet and sour. Som tam boo pla ra – This is a very common version that uses fermented fish sauce and crab in the recipe. Tam ba – Litearlly translated to jungle, this salad includes all sorts of things, plus freshwater snails. Tam sua – This version includes green papaya, fermented fish sauce, and rice noodles. When you’re in Thailand, if you go to an Isaan restaurant or street food stall, you can choose to order whatever type of green papaya salad you prefer. But for this recipe, we’ll be making som tam Thai. One of the main dressing ingredients for this Thai green papaya salad recipe is palm sugar which balances the sour lime juice of the dressing. 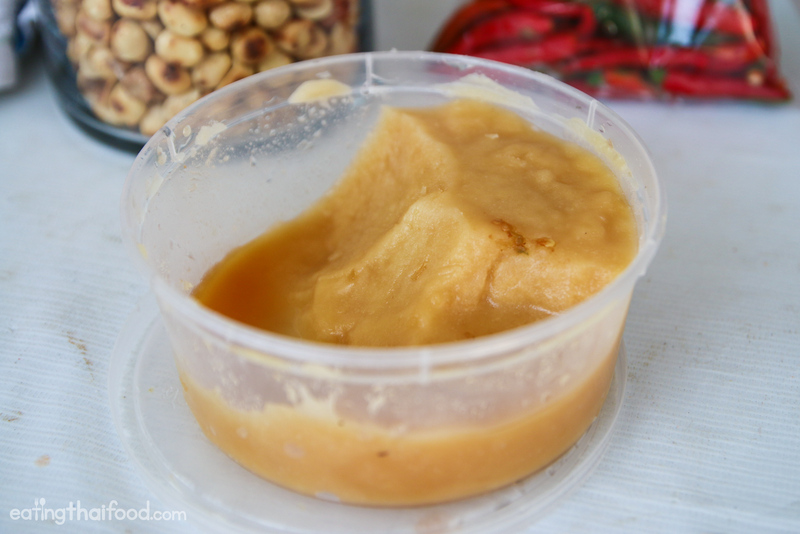 In Thailand you can get palm sugar in every local market very easily, and in countries throughout Europe and the USA, you should be able to find palm sugar at any Asian supermarket. Alternatively, you can even buy palm sugar on Amazon. Freshly roasted peanuts are another one of the necessary ingredients when making Thai green papaya salad (som tam ส้มตำ). For the best taste, I like to get raw peanuts and roast them myself, so they have a nice fresh crunchiness to them. However, you could always just use any kind of roasted peanuts for this recipe, just preferably roasted unsalted peanuts. Finally, before we get into the main ingredients and step by step instructions for this Thai green papaya salad recipe, I just want to quickly go over the base ingredient you’ll need: green papaya. When you think of a papaya, you might think of an orange colored fruit with little black seeds in the middle that’s extremely sweet. But green papayas (which are literally papayas that are picked unripe, so they are hard and green), not only appear completely green, but they taste completely different. They almost have a neutral cucumber like flavor. The full Thai street food setup! Although you could substitute a different ingredient for this Thai green papaya salad recipe, it’s really worth it to go out of your way to get a green papaya. It can’t be compared to anything for the texture. And again, I have seen green papayas available at Asian supermarkets throughout the US. To prepare the green papaya, first you want to peel off the outer dark green skin. 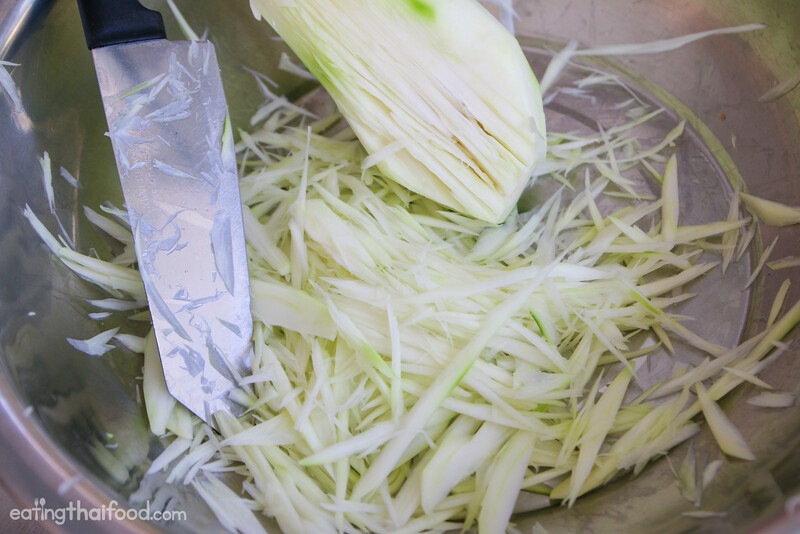 Then either using something like a cheese grater, or chopping it manually with a knife (see the method in the video), you want to julienne your green papaya. Since this is a salad, you don’t need to cook it. However, you do need to pound it. Using either a clay mortar and pestle (I used one like this in the video), or a wooden mortar, first pound the garlic and chilies, mix in the seasonings, and finally add the green papaya. You don’t need to pound it very hard, but it’s more of a mash and mix motion. Alternatively if you don’t have a mortar and pestle, you can mix all the ingredients in a big bowl. Just like all of the Thai recipes, the ingredients listed (and the quantities) are a guide – it’s what I used – but make sure you use it loosely. Thai food is made to taste the way you want it to, so make sure you balance out the flavors to your specific liking. Thai green papaya salad (known in Thai as som tam ส้มตำ) is an extremely popular dish in Thai cuisine. 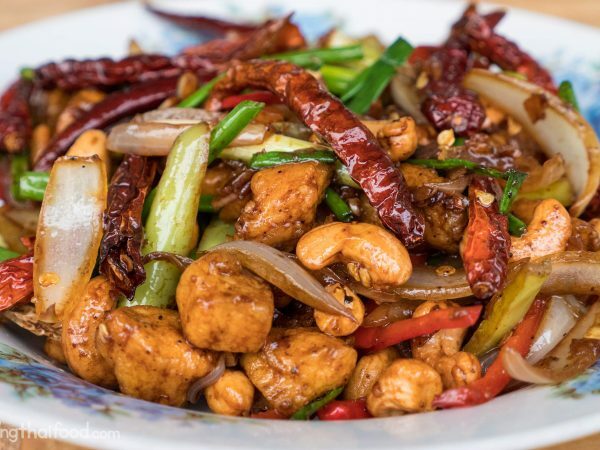 It's fresh, and balances all the flavors of sweet, spicy, salty, and sour, to perfection on a single plate. After washing the green papaya, peel off the skin using a carrot peeler (or a knife will do as well). You can then either use a cheese grater to shave the papaya, or you can do it the traditional way and hack at the papaya with your knife until there are numerous vertical cuts, then shave off the top layer into thin slivers, and repeat. I like the traditional method as you get bigger, un-even, pieces of green papaya. Cut enough green papaya to have a big handful worth for this recipe. Add 2 cloves of peeled garlic and 5 chillies (or however many you like) to the mortar (krok). Pound them for a few seconds until the garlic is crushed and chilies are reduced to small bits. Add ½ tablespoon of palm sugar, 1 tablespoon of fish sauce, and then squeeze the juice from 1 - 2 limes into the mortar. You can always start with less seasoning and add more to your liking. Mix and pound the dressing, making sure the palm sugar gets fully dissolved into the liquid (so no one bites into a chunk of pure palm sugar). 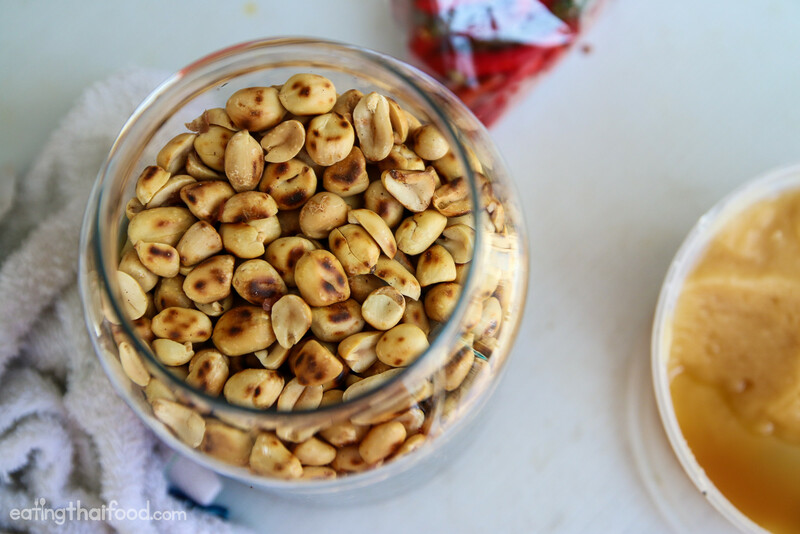 Add about 1 tablespoon of roasted peanuts (no need to measure, just grab some with your hand), 1 tablespoon of dried shrimp, and then roughly slice in the tomatoes into the mortar. Pound the mixture for about 30 seconds, lightly breaking up the tomatoes, shrimp, and peanuts. No need to pound too hard. Last step is to toss in a big handful of the green papaya shavings. Mix it all together, doing a combination of using just a spoon and pounding lightly, but no need to pound hard. Make sure the dressing is coating all the green papaya and that the salad is evenly mixed through and through. If you don't have a mortar and pestle, just chop up the garlic and chilies, and prepare everything in a metal or glass mixing bowl. 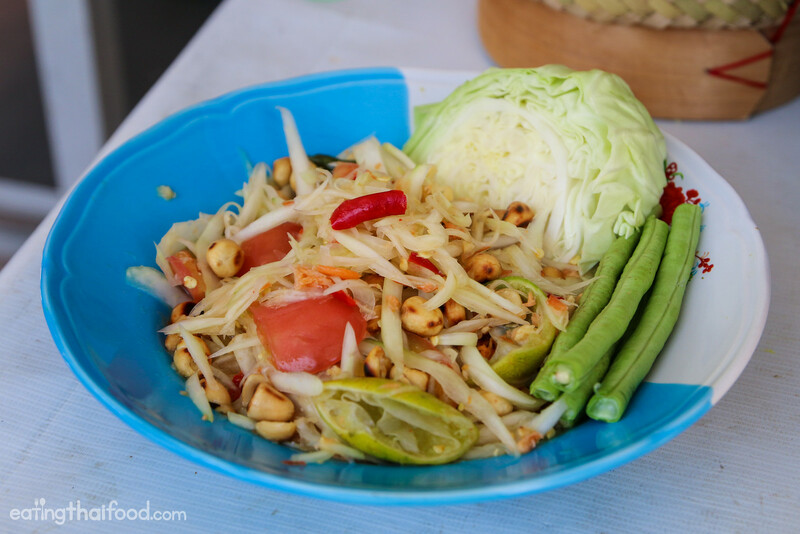 Dish out the green papaya salad onto a plate, and I like to then sprinkle another small handful of roasted peanuts on top. 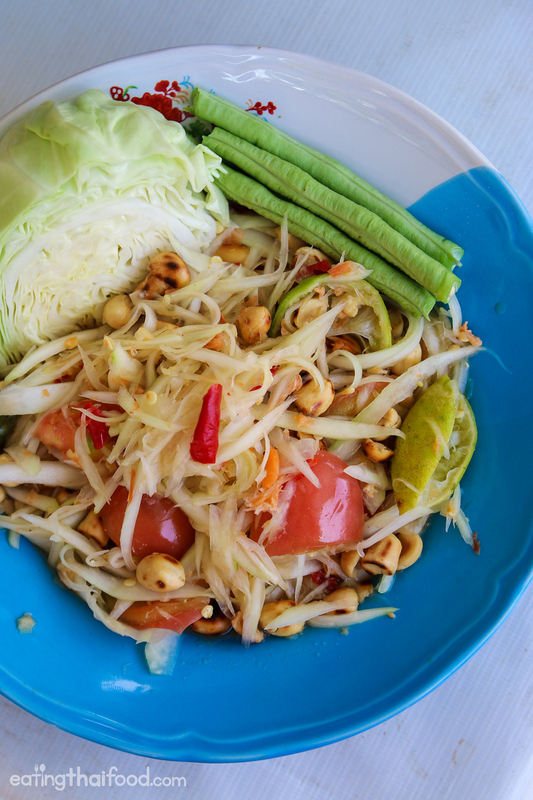 Garnish your green papaya salad with pieces of raw Chinese long-beans or green beans and a wedge of cabbage. In Thailand, som tam is eaten with Thai sticky rice. 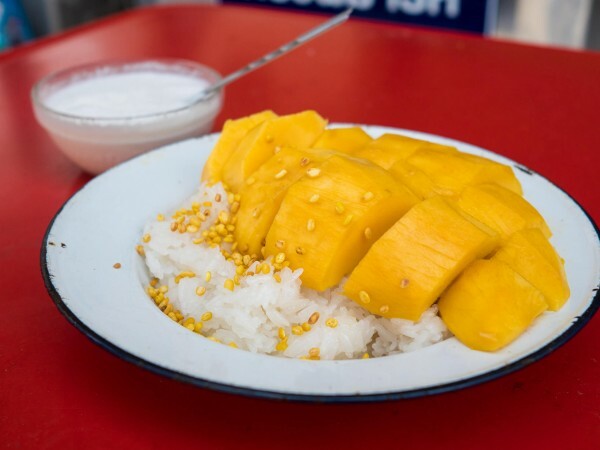 You can grab a small ball of sticky rice in your fingers, dip it into the green papaya salad dressing, and then pop it in your mouth. Thai green papaya salad (som tam Thai)! As long as you can get your hands on a green papaya, this Thai green papaya salad recipe is easy to make, and tastes incredibly good. If you want to have a full meal, also make some Thai grilled chicken, and steam some sticky rice, and you’ll have an amazing full Thai street food meal! 80 comments. I'd love to hear from you! 1st & 4most mark micha is the man no joking your the man! I never thought I’d 💘 food as much but you’ve given me a new found passion to travel the 🌎 from my very home,i told my wife i might not be able 2 afford 2 take her around the 🌎 but i surly can bring it to her via food.thanks mark for being you and traveling the 🌎 and eating awesome food 4 those of us that can’t may the good Lord watch over you and your family. ?do you have any tshirts in brown? Please add a recipe of thr Boo Pla Ra version. I watched one of your video today and I want to try it too! Thanks for your work, I cook a lot and you’ve openend a new world for me. I left out the shrimp paste and used green mango – perfection. It was just as good if not better than the salads I ate in Thailand. Thanks! As there is no chance at all of laying my hands on some green papaya here i Spain, I used shredded Zucchini instead. It tasted surprisingly similar to the real thing! Thanks for your wonderful recipes! can I substitute green mango for the papaya? The recipe of Thai papaya salad looks great & easy. I really want to try it.You have given a very clear explanation of the ingredients & the method. will try it & let you know. It turned out really well. I just added a tsp of thai sauce as well. Will make some soon. Got a lot of papayas after Hurricane Irma passed through my yard. Hi Mark, could I substitute the papaya for green mango? Hi, There is a thing in Thailand called “Tam Mamuang”, a green mango salad (Som Tam style). You can use this recipe but your green mango has to have the least sweetness as possible and choose the very sour type. Then leave out the lime juice and tomato (or add back at the end to your liking). I might consider adding more sugar and slightly more fish sauce to balance out the sourness. Like Mark mentioned, Thai foods require personal touch!! great videos Mark you are introducing us to a whole new cuisine thanks! I tried this recipe and it’s really good. I love it. Thanks for sharing the recipe. You have very nicely shown how to make this salad. I might try it at home. Hi Mark – Recently found your site and I’m loving your blogs, recipes, and vlogs. Trying to prep for a dinner party and want to prepare ahead of time. Can I shred the green papaya a day in advance without losing quality? Thank you. I viewed these on tv and I want some. What another wonderful recipe! It is so hard to find green papaya here in the states but it is so worth it if you have all the ingredients and recipes to create Som Tam. The refreshing flavor along with the spice is something that can not be beat. 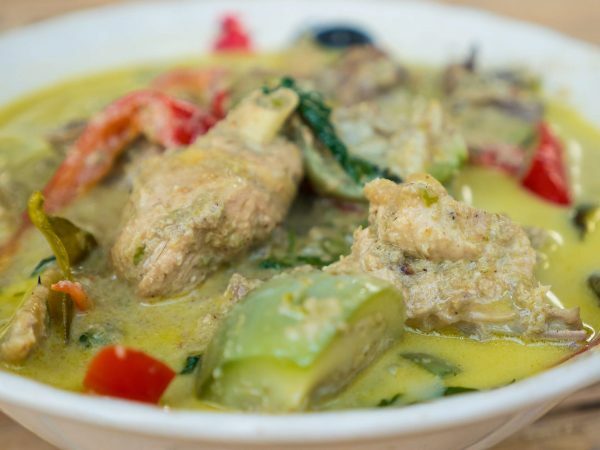 Check out our recipe at Thaidirect.co and let us know what you think! That looks delicious and easy thank you. Thanks for the recipe! My mouth is already watering. Btw, can we use long been instead of papaya salad? Would it make any sense? Hi Nguyet, you’re welcome, glad you enjoy this recipe. Yes, actually you can make it entirely of long beans, that’s another fairly common version you’ll find in Thailand as well. Enjoy! Thanks so much for this recipe. I added a bit of soy sauce and left out the dried shrimp and palm sugar which turned out excellent. Great to hear that Cleo, glad you enjoyed it. Absolutely delicious. I used more papaya then you called for and some shredded cabbage as the base (didn’t have fresh green beans), followed the rest of the recipe exactly. My husband didn’t want the dried shrimp, so I left it out of his, but added it to mine. It really adds a lovely funky umami to the salad. Very well balanced. Thanks for the recipe! Thanks for sharing this very delicious recipe! I substituted kohlrabi for green papaya, which worked out pretty well! Hi Rike, you’re welcome, glad you enjoyed this recipe. That’s a great idea! Hi! I just had somtam recently and I was looking for th recipe and I came across this! Thank you so much! Now I can make my own somtam!!! Hi Paris, awesome to hear that, enjoy your som tam! Great dish but palm sugar comes from clearing rain forest and should be avoided. I grew up in Thailand (1st on Senaneekom 1 & then laang Wat Bangnamchon). I learned to made my curry paste from scratch from childhood. Som Tham with crab was my all-time favorite!! I make it here now, but for the longest time, the ingredients weren’t available in the US. Your recipes take me back home once again. Thank you. Your recipe is exactly as I had this last week on the streets in Bangkok. I will be having this dish with tom yam shrimp tonight. As I have never cooked any Thai dishes your recipe and directions make this quite simple. I will admit the tom yam shrimp is coming from a bag of prepared herbs and ingredients that I brought back with me. Six days on and I am still adjusting my time clock! Hey Rodney, awesome to hear that, hope you had an amazing dinner! Thanks for this great recipe. I always had it in my head that this would be really hard to make but I’m relieved to find its a pretty easy job (I cut the papaya by hand and got some use out of the mortar and pestle making the dressing). It’s also cheaper than at most restaurants. Next time I’ll have to make some sticky rice and get some yard long beans. Hey Zainab, thank you very much, glad you enjoyed it! Thank you very much for this excellent recipe which is very close to som tam that I have tasted in Thailand and Thai restaurants here in Christchurch, New Zealand. As I did not have a few of the ingredients, I substituted carrots for green papaya, roasted cashews for peanuts and lemon juice in place of lime juice. I also added thin julienne red capsicum. Because the dressing and light pounding are critical for this Thai favorite, my carrot som tam tasted just as great. Hey Siang, you’re welcome, glad it turned out so well, and thanks for sharing your substitutions – sounds delicious! Hi Amanda, good to hear from you, glad you enjoyed this recipe! Great recipe….simple to make! Thanks. You’re welcome Johnny, glad you like this recipe, thanks! do you guys have an instagram account? I just crossed Thailand several times and circled it even more and must say you just didn’t lose a bit! Thank you Peter, I’ll remember that for next time I’m in Khon Kaen! Great recipe turned out just like my local Som Tam lady’s, now for the Khao Niao!! Great to hear that Callum, thanks for sharing. would this recipe still work without the fish sauce and other fish ingredients? perhaps an extra tablespoon of lime? or would you have a suggestion for something else? i’m vegan so don’t eat fish but would love to make this recipe! Hi Krystle, good to hear from you. Yah, you might try adding a touch of just salt or soy sauce, and I think it would work well. Let me know how it goes! Great recipe! I used liquid honey instead of Palm sugar. Also roasted cashews instead of peanuts, as that was what we had on hand. Turned out great. That sounds delicious Damien. Glad you enjoyed it! Love the recipe posts, keep them coming. I’m looking forward to a southern Thai curry. And also one of those nam prik sauces, that stuff is delicious. Thanks Paul… definitely going to keep adding more recipes. Nam prik sounds good! I have lived in Issan Buriram on and off since 2004. Have found the crabs mainly added to som tam ส้มตำ in Bangkok. In Buriram, it is served as you describe. I craved it when I returned home and made it when a Papaya became available but there was something missing that you also left out MSG Luckily I had some in my pantry so saved the day.. There have been times i have substituted Papaya with Carrot and Cucumber, I know its not the same but i live in Ireland. Was looking up your Larb recipe.and came across your recipe for som tam ส้มตำ. remember the MSG its in everything in Thailand they even have the biggest MSG factory in the world, 5 STARS.